The Platinum Music Awards celebrate the lifetime achievement of New Mexico’s music heroes and icons. 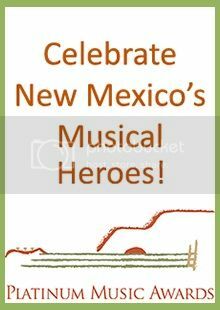 The Awards are an evolution of the New Mexico Music Commission’s Platinum Achievement Awards – given to musicians, music supporters, and music organizations or businesses that have demonstrated the highest level of achievement and have contributed significantly to the musical culture of New Mexico. New Mexico residents nominate musicians, composers, music related businesses (music stores, studios, production facilities, record labels, etc. ), and organizations (performance venues, groups and troupes) during February through March 15, and then a select committee meets to determine the six honorees, who are announced on April 19. In addition to honoring six major music figures, some of New Mexico’s best and most diverse musical talent performs in this unique musical variety show. The Platinum Music Awards are a benefit for the New Mexico 's public schools.